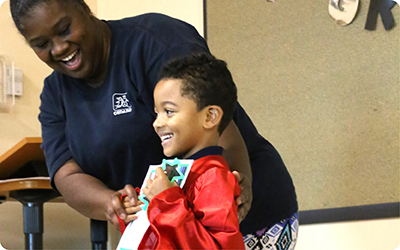 The Activity Room at Northbridge Community Center held a packed audience last month for 33 beaming children preparing for kindergarten. The 6-year-olds donned caps and gowns and said farewell to their teachers and friends as they prepared to begin adventures at new schools. During the August 10th ceremony, graduates and their loved ones in attendance watched a slideshow of what they learned over the past year. With a strong focus on social and emotional development, the CEDARS team utilizes curriculum-based individual goal planning and assessments to meet the needs of each child. Both of CEDARS early childhood development centers are accredited through the National Association for the Education of Young Children (NAEYC). Early Childhood Development programs have been a part of CEDARS continuum of care since 1992. Since that time, CEDARS has served the community by providing early childhood care for families who would otherwise not have access to quality child care. This stability in their lives and in their neighborhood has not only reduced risk for Adverse Childhood Experiences (also known as ACEs) but has built stronger families by providing the supports necessary to keep loved ones together and bolster healthy relationships.